A hospital in the Iraqi city of Falluja, mainly controlled by Islamic State (IS) fighters, has been hit by government shelling, reports say. It comes a day after PM Haider al-Abadi ordered the Iraqi army to stop shelling civilian areas in towns seized by IS. 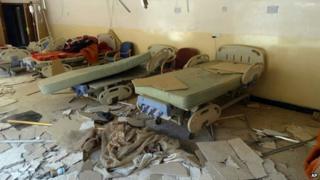 A member of staff was seriously injured in the shelling, medical officials at the hospital have told the BBC. Many residents of Falluja and Ramadi have said they are more at risk from army air raids than from the jihadists. The extremist group overran the two cities, which are both in the mainly-Sunni Anbar province, in December 2013. IS, also often referred to as Isil or Isis, has since taken over large swathes of Iraq and Syria and declared the land it controls a "caliphate". A medical source at Falluja hospital told BBC Arabic it was hit by four missiles launched from a military base some 5 km (3 miles) east of the city at 11:00 local time (08:00 GMT). However, there are conflicting reports in Iraqi media over the source of the shelling. It comes a day after Prime Minister Abadi instructed the Iraqi army to stop air strikes on residential areas under IS control, to avoid more civilian victims. The new Iraqi leader is trying to win back the trust of the Sunni minority in Iraq, which sees itself as having been victimised under his predecessor, Nouri al-Maliki. At least 50 people are reported killed and 200 injured in six explosions in several cities.